We just finished reading this one together last week. It took awhile! I had actually never read it, myself, so I didn't really know what to expect. The most I knew about it was that a toad and some friends went on some kind of adventure down the river. (I know! And I call myself a children's librarian!) I was partly right. There is a toad...and a river. They never really go all together on the river, though, and while Toad does venture from home, the other 3 do not. It's much more about their life in the English countryside through the course of about a year, than it is about any grand adventure they set forth on. Toad would be the exception to that, as he creates adventure wherever he goes. So--in case I am not the very last soul to have read it, and you were wondering--there you go. 3.5 stars: Some parts we loved and some that really dragged, but overall a positive experience. 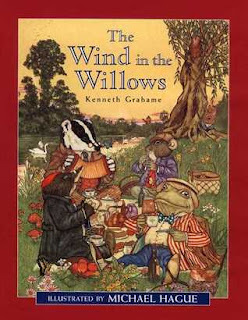 Mr. Rat and Mole live together in a home in the riverbank, Mr. Badger lives in the Wild Wood, and Toad lives in Toad Hall. So these animals are English gentlemen. Mr. Toad is the impulsive troublemaker, with the silver tongue, charm, and money to talk his way out of his escapades (usually.) The others do their best to squash him regularly, so that he doesn't get too conceited and make a nuisance of himself. Mr. Rat is a very practical and straightforward chap, friendly to everybody and eager to solve problems. Mole is a bit timid at first, but eventually comes into his own. Badger does not suffer fools gladly (Toad!) and is known to be quite fierce, though underneath he has a loyal and soft heart. It's a meandering sort of story. Their adventures are of the more genteel sort--getting lost in the Wild Wood, searching for a lost otter pup, trying to keep Toady out of trouble (which proves to be impossible), finding Mole's old home and staying in it for awhile. We find out how Mr. Rat and Mr. Mole meet and decide to become friends and flatmates. We go along on the fateful picnic when Toad's obsession with driving fast in a motorcar first besets him. Toad has some high times by himself, because of his own rash decisions and muddled thinking whenever he comes near a motorcar, and eventually the friends are all reunited to restore Toad Hall to its rightful owner. You just feel that he does need a good squashing--regularly! Good thing his friends provide it for him. To be completely honest, I wish we had found an abridged version--which are abundant, by the way. Goodreads has pages and pages of them. Many of the events in the story were fun or thrilling or exciting, but then there's also long paragraphs talking about the beauty of the light falling across the grass, or the habits of migrating animals. I found myself summarizing quite a bit after yet another long soliloquy on some topic or another. The chapters with Toad in them moved along the most smartly. One of the very slowest was when the Sea Rat came through and told stories to Mr. Rat, almost convincing him to give up hearth and home for a life of adventure. Perhaps now that we have all heard the original and know the story, the kids will be able to pick up an abridged version on their own, and jump right in with delight. At least, that's my hope. I would love to hear it on audio, read with a proper British accent. I can't finish without mentioning the illustrations by Michael Hague. They were utterly charming. There were around 5 per chapter, including a mix of smaller ones, full page, and full 2-page spread. They really brought the story to life for us. In fact, they were the reason I picked up this version over the other 3 right next to it on the library shelf. Do you have a favorite version or illustrator of this book? What classics have you never gotten around to reading?